This guide will demonstrate how to add custom fields to a WordPress Menu and how to then modify the Menu’s HTML. Menus are used to group menu items. Learn how to add fields to Menu Items. The Advanced Custom Fields plugin makes it very easy to add custom fields to a Menu, please follow the steps below. Change the Style setting to ‘Seamless’ if you wish for the field group to appear joined to the core settings (No heading or border) as shown in this guide’s screenshots. 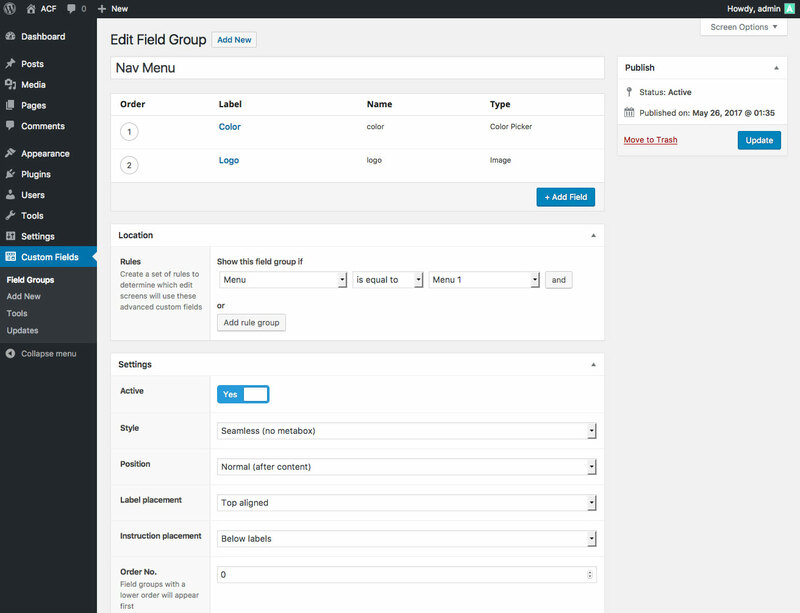 Once you have created a field group and assigned it to appear for a Menu edit screen, editing the field values is done by navigating to the Appearance > Menus admin page. WP stores each Menu as a term object in the wp_terms table. ACF will store all custom field values in the wp_termmeta table. 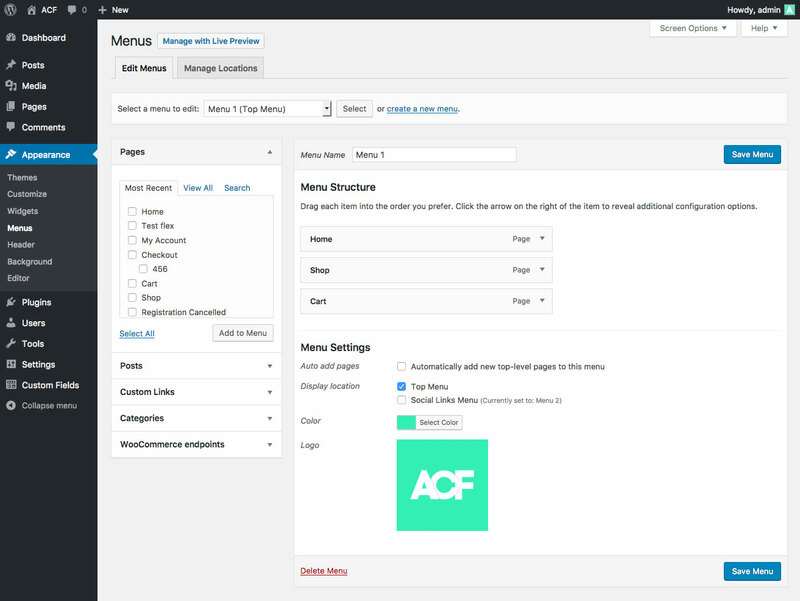 Customizing the HTML for a WordPress Menu can be easily done via the wp_nav_menu_items filter. This filter is run each time a Menu is rendered (via the wp_nav_menu() function) and allows you to modify the <li> elements HTML for the Menu. 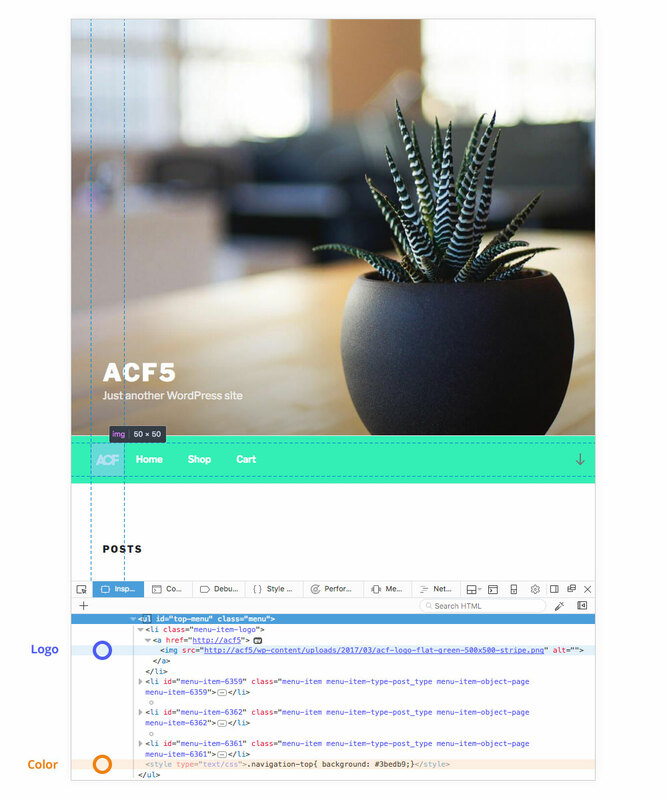 This example shows how to modify the main navigation menu from the twentyseventeen theme (Menu location is called ‘top’ in this theme). Please note that a second argument is required by the ACF functions to specify where to load the value from. Because each Menu is a term object, we can simply pass this object as the second parameter. The Menu term object is found by using the $args->menu data. Here is a look at how this may look in your browser. Notice the new logo <img> and color <style> elements!